Anthony draws attention to a bilious diatribe by Trenberth against “deniers”. There have been several examples of people who have come into the field of climate change and done incredibly stupid things by applying statistics in ways that are inappropriate for the data, [Trenberth] says. I wrote back and forth with Trenberth a number of times in respect to his earlier comments about me – the correspondence is online here. After several attempts to get Trenberth to justify his allegations, Trenberth challenged me to respond to the criticism at realclimate. When I did so, Trenberth discontinued the correspondence without justifying his comment. Debating them [“deniers”] about the science is not an approach that is recommended. In a debate it is impossible to counter lies, and caveated statements show up poorly against loudly proclaimed confident statements that often have little or no basis. Scientific facts are not open to debate and opinion because they are evidence and/or physically based. Moreover a debate actually gives alternative views credibility. So my feeble suggestion is to indeed cast aspersions on their motives and throw in some counter rhetoric. Labeling them as lazy with nothing better to do seems like a good thing to do. But their critics are another matter entirely, and their false claims have not been scrutinized or criticized anything like enough! However, Trenberth himself advocated the strategy of casting aspersions on critics instead of scrutinizing their arguments and, as one of the architects of this strategy, is hardly in a position to complain. The way to counter lies is obvious – show evidence that statements are lies. For example, when Mann said that I had asked for an Excel spreadsheet and that they had inadvertently introduced errors in the process of tailoring the data for this special request, the way to counter it is to produce the original email showing that we had not asked for an Excel spreadsheet but an FTP location and that the dataset that we were directed to at Mann’s FTP site was dated long prior to my inquiry. (The data set was deleted by Mann shortly after this incident, thereby removing this evidence.) Or when Mann told the NAS panel that he hadn’t calculated a verification r2 statistic as this would be a “foolish and incorrect” thing to do, the way to counter this was to examine his original article which showed the verification r2 statistic for the AD1820 step and, when code became available for this step, to show that the code calculated the verification r2 statistic in the same step as the RE statistic that was reported. AR4 was the first time Jones was on the writing team of an IPCC Assessment. As a veteran of 3 previous IPCC assessments I was well aware that we do not keep any papers out, and none were kept out. [climate scientists] are unlikely to make false claims that other colleagues can readily show to be incorrect. Unfortunately, we’ve seen too many incidents where climate scientists make false claims that are readily shown to be incorrect. We need think back no further than Jones’ claim that CRU had confidentiality agreements that contained language prohibiting the distribution of data sent to Peter Webster to “non-academics”. FYI, Phil Jones was also listed as a “Contributor” to IPCC FAR (1990) Sections 6, 7 and 8 pp. 348-349. (Later this role was called ‘Contributing Author”). [Update Jan 20] Trenberth’s CV (as pointed out by Dave Clarke) shows that Trenberth had also been a Lead Author in 1995 and 2001. However, as discussed here, Jones had not merely been a Contributing Author to IPCC 2001, he had been a Key Contributor who had been part of the Chapter 2 “writing team”. This entry was written by Stephen McIntyre, posted on Jan 13, 2011 at 7:53 PM, filed under Uncategorized and tagged mck2004, trenberth. Bookmark the permalink. Follow any comments here with the RSS feed for this post. Both comments and trackbacks are currently closed. Exactly my thoughts earlier when I picked this up from WUWT and Lubos Motl. Lubos makes the excellent point that the journalists Trenberth complains are part of the big conspiracy against the good people like himself have far fewer ‘deniers’ proportionately than the AMS to whom he’s producing this later this month. Not a high chance of a big conversion rate to the ‘consensus’ point of view based on that. An earlier response agreeing with Trenberth’s desperation is ‘awaiting moderation’. In the meantime I’ve read the Trenberth section of the April 2006 post Thacker’s “Sources” that Steve links to. Absolutely appalling. How dare these people still feel free to pontificate at the AMS or any other level. It’s time for change – oh yes we can. Don’t worry, his rhetoric will sink him there. I feel more convinced of it than I ever have. Roll on 23-27 January. I read the linked PDF- it seems to be surreal at times. He says you can’t argue with scientific facts – he’s begging the question. I’d agree if he were referring to verifiable scientific facts. The facts being offered conform to “I used this data set, massaged it this way, and got this result”. The next step is a leap of faith in generalizing past the actual results. And, as everyone who has read this blog even casually knows, much of the “scientists” work is unverified, and some completely unverifiable. Again, he says scientists aren’t advocates, but also says they should discuss what to do about global warming. That’s a political advocacy – something should be done about global warming. I fail to understand how anyone with even a BS in one of the hard sciences, much less a Doctorate could make a statement like that. Whilst plainly daft, I think there might be interesting logical connotations of that suggestion which Treberth hasn’t thought about. If the null hypothesis is that all weather events are affected by global warming, then any type of event the of which frequency or severity has not changed significantly in a measured period is evidence against the IPCC conclusion. If, as we believe, extreme weather events are cherry-picked by advocates from a mass of boring normality, then we should be able to analyse the boring normality and show a lack of trend. Bearing in mind that we don’t have to look for very long-term trends – a decadal trend would do just fine for this – they should be relatively easy to find. It’s not the one Trenberth that worries me, but the hundreds that will simply sit there and listen, some of them out of conviction, most for sheer conformism. Thank you for the link to that testimony Lucy – awesome. Posted this at Judith Curry’s a few minutes ago. Seems relevant here. Trenberth’s lecture looks like a highly conscious first-strike in the “surge”- type propaganda tactics being talked up a few months ago, to counter the public doubt/apathy in the wake of Climategate. The highly provocative attempt to turn the tables on sceptics, via the Null Hypothesis reversal, clearly has everything to do with political posturing to see what he can get away with, and nothing to do with scientific debate. It’s a clear attempt to gerrymander the terrain from under the feet of sceptics, simply because they were winning, and to make up new rules based on his own “Royal” authority. It will be interesting to see how much the MSM (whom he somehow manages with a straight face, to criticise for not being on-side enough) help him to get away with this brazen sleight of hand. He forgets that every time he points a finger at someone he has three pointing back at himself. Re: Verity Jones (Jan 13 20:47), Precisely. One. Two. Three. Sadly, the answer is “absolutely, yes”, and not just teachers. As a professional scientist for nearly thirty years, I know there is a difference between the noble ideals of ‘science’ and the all too human frailties of ‘scientists’. There is a saying I heard from the legal profession that parallels the situation rather well: “Justice is what we hope for in the next life, the law is what we must put up with in this”. Logic is usually taught in English or Philosophy rather than in “science” courses. The reason has traditionally been that one needed to able to construct logically sound arguments in a literary or oral format, and that any informed person also needed to be able to critically examine another’s arguments. Sound and critical reasoning skills are valuable in all parts of life, not just science. “Consumers,” however, equipped with such skills are desirable in markets and ask baffling questions of salesmen, like, “why would I want this?.” The emergence of profound thinkers like Trenberth is something I attribute to the triumph of marketing over education. Computers have made some hard-core logic relevant in some applied work as well, so that it shows up pretty regularly in engineering, statistics, and computer science. I don’t know for sure, but I’d guess that today it’s at least as common there as in English or philosophy. Further, I’m reasonably confident that a majority of those people who understand inductive “logic” (or inductive reasoning anyway) well enough to say quantitative things about it (e.g. Bayes’ theorem, various bounds on learnability of different kinds of regularity, compressibility…) have learned largely on the math and applied engineering-oriented side, not the classics side. I’m a mathematically oriented computer programmer and several times I’ve chased the fundamentals of how useful software works down into into logic. E.g., one book I happen to have on hand is Lambek and Scott _Introduction to higher order categorical logic_, which you can reach by starting with the kinds of proof-checking software used to verify the correctness of some kinds of integrated circuits and chasing down through the mathematical formalism used to express such proofs. Machine learning and related statistics calculations provide other starting points where applied work can lead you into other serious work in logic, though it might not appear in the title of the book you’re led to: e.g., the title might refer to “set theory” and the text might not try to separate out that part of set theory which is elsewhere called “logic”. As regards logic courses, what you describes pretty much what I am complaining about in education. Exposure to logic is regressing into specialty areas like computer programming, where it is essential. Logic was once one of the founding blocks of education and was located where exposure to it was inescapable. Any student, in any major, HAD to be exposed to logic and critical thinking, since every major required English. Not all required math at a level that would lead to familiarity with set theory, or Bayesian logic – the latter wasn’t a common component in basic mathematics courses even in the early ’70s. I’m obviously blind, but I can’t find Jones in that image above. Simon, top line under “Contributing Authors,” sixth name in: P. Jones. The top line is internally alphabetized, as apparently those folks are classed differently from those following. Kevin Trenberth, by the way, is down among the Contributing Authors, second class, so apparently Phil Jones outranked him that year. Many thanks for the first hand input and reminders of Trenberth’s past casuitries. It sounds like the familiar war among two-year olds, “It’s mine!”, evolved into a turf battle among adults. Please keep disclosing your shallow thoughts, Mr. Trenberth! It seems indeed to have been deleted, but is it established that it was Mann who ordered the deletion? I guess he “owned” the datafiles? Then it does not matter in my eyes wether he was involved the actual removal or not, he is still responsible for the removal. If he didn’t approve of the removal he had every opportunity to protest publicly. Removed from public access he means. I’m sure there’s a private copy somewhere. methods that are being employed. I used to have considerable respect for Trenberth’s scientific credentials, but he is fast losing it. 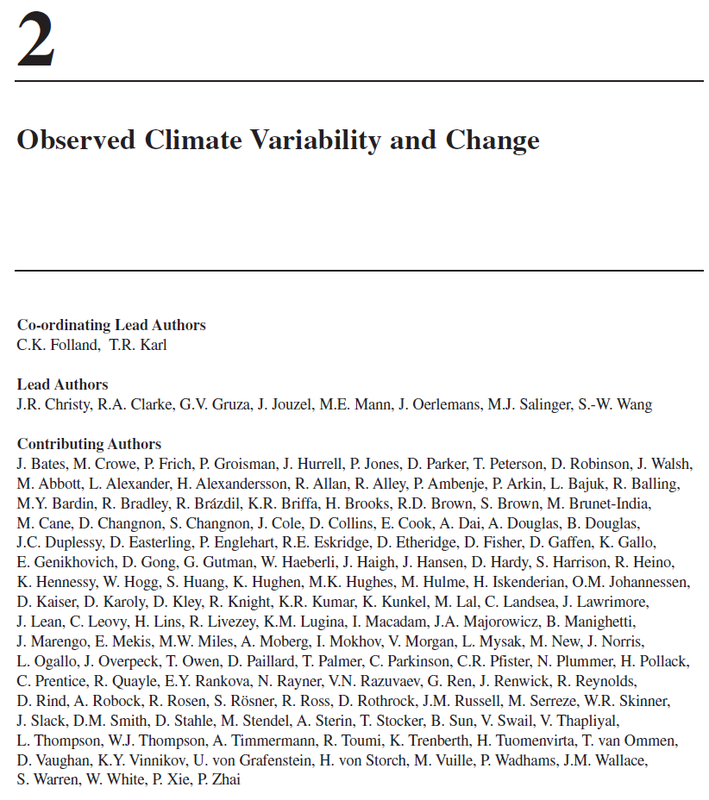 For the record, both P.D.Jones and K.Trenberth are listed as contributing authors of Chapter 8 (Model Evaluation)on p 471 of the IPCC TAR (2001). Trenberth didn’t mention any names and as it stands his statement could even be a reference to Mann, Bradley and Hughes’ amateurish 1998 and 1999 papers. It certainly fits them rather well. intended his comment to be taken as a referenec to M&M. Debating [deniers] about the science is not an approach that is recommended…. a debate actually gives alternative views credibility. Good pull quotes. It boggles the mind how a “scientist” could not understand that the debate is about one issue – not muddying the waters with multiple “points” to debate. The debate is clear. Has the null hypothesis been disproven? Claiming a concensus instead as a reason to dismiss it instead of using the scientific method indicates politics, not science. This is the real heart of the matter. I’ve you’re going to reverse the burden of proof, you have to examine and then deconstruct the “proof” which is presented to refute the “accepted” theory. But this is precisely what the AGW crowd won’t do. They not only don’t look at the serious criticisms of their theories, they won’t allow others to either by things like stacking the deck in peer review and being unwilling to allow critics to present their evidence at major conferences or in publications like the IPCC reports. He starts his address trying to get the sympathy vote, decent people of course did not find the death of Professor Schneider cheering news. The good Professor was good at ‘communicating climate science’, one year we were in for new ice age the next year catastrophic global warming. Yes a veritable Vicar of Bray of so called climate science. Dr Trenberth’s artical is a politcal rant and not a very good one, as he uses special pleading, begs the question and ‘misspeaks’ on too many occasions. If this is a typical example of his work and he is typical of IPPC contributors then it is no wonder that IPPC assessments are unable to withstand scrutiny. snip – please do not try to coatrack other issues into this thread. Respectfully, I’m not sure what “coatracking” other issues means. I pointed out that the central premise of Trenberth’s presentation relied on interpreting IPCC AR4 as an unequivocal endorsement of AGW – whereas Pachauri had already agreed to retract this point from the official Cancun proceedings after Revkin pointed out it wasn’t true. This seems to me to be highly relevant to the discussion of Trenberth’s presentation since it undermines one of his main points. Steve- attempts to debate AGW in a couple of paragraphs are against longstanding blog policies. Anthony is more tolerant of this than me. I seem to have had the “Real Climate” treatment for making an entirely relevant contribution – I’m confused. Trenberth gives us food for thought. Can one reverse the onus of proof for the null hypothesis? My understanding of the null hypothesis is that it is a statistical concept – whether two groups hav a statisically significance difference. It matters not if the control, untreated, existing or historical group is called Group A or Group B, and the observed, treated, studied or new group is called B or A. The null hypothesis is concerned with a difference between the two group. Neither group has moral superiority to the statistician – the difference is all that matters. So, in the very next paragraph Trenberth gets into a muddle in tryng to describe the “new” null hypothesis. It appears that Trembath has become confused through failure to consult his statistician. I hesitate to call him a failed climatologist, but his comments elsewhere on the Qld floods suggests that he has also failed to get competent advice from a reputable scientist in Australia concerning the past record of Australian climate. We have seen it all before, and there has been no climate change (statistically signicant, that is) in 150 years. It appears that Trembath has become confused through failure to consult his statistician. Maybe just one more case of “incredibly stupid things by applying statistics in ways that are inappropriate for the data”. Trenberth’s statement :”Scientific facts are not open to debate and opinion because they are evidence and/or physically based.” is simply false. While the mass of the proton is pretty well established and not open to debate, string theory and dark matter sure are open to debate. Whether hurricanes will increase or decrease in strength and frequency under climate change has not been established, and Trenberth is using the tactic of asserting a false closure of the scientific process. I also sense that by his definition, critics are outsiders, but “colleagues” are those who agree with you. I don’t know about the mass of the proton, but when I was an undergraduate at Caltech (long ago), an annual ritual called “Physics Lab” set the entire freshman class to work trying to prove that the electron does not have an integer charge, by replicating Millikan’s experiment. This was not to be taken as an article of faith based on an IPCC proclamation a la Trenberth, but as a matter of observation. Trenberth’s writings in the above link appear to me to be nothing more than a call to arms for climate scientists to be more advocates and to get closer to the political process. His straw man, as the prototypical denier constructed by the some advocates/scientists, apparently is easier to argue against in that Trenberth/advocate/scientist gets to define or imply what the denier holds to be true. Serious skeptics are not deniers in that deniers might want to argue about whether there has been warming, and can GHGs cause warming. The serious skeptic concerns, which Trenberth appears not to recognize fully, are the uncertainties of the predicted levels of future warming and the potential consequences of future warming, be they beneficial or detrimental. Trenberth also fails to address the major political concerns some skeptics have about the mitigation being worse than the problem it is supposed to mitigate. Trenberth stands on its head the normal political disinterested and conservative null hypothesis of most scientists and truly exposes his advocacy in this matter. If we were to concentrate on the Type II error avoidance, as Trenberth presumably suggests I suspect that we would scientifically give the nod to a very large number of mitigations for a whole host of problems. If I were to assume that we should be mitigating a whole host of problems, that we currently have avoided, and without concerns of unintended consequences, then maybe I would be making statements like Trenberth – but the comments sure as heck would have no foundation in science. As you point out, Trenberth mixes politics and science, seeming to argue that since he says the science says the earth is warming, the politics must follow to keep it from warming. This logic is interchangeable, whether it’s warming or cooling, with the apparent desired political outcome of a constant temperature. Separating the science from the politics, when I see a result where ALL the details of how it was achieved is not disclosed I view the resuts as interesting but suspect. I would only use the results for making a decision that mattered if I had no better alternative. In any event, I don’t think that Trenberth doesn’t recognize the serious concerns of skeptics. I’ve seen a number of “experts” who avoided admitting they were flat wrong by a dismissive wave of the hand and some accompanying language that let everyone know that they were the experts, and so their statements must be accepted and not questioned. It’s just playing a role. There must be some kind of Climate Science Tet Offensive going on here, as Michael Tobis has just posted over at Briggs’ site (Link on the Blog Roll). [climate scientists] are likely to make claims that other colleagues can readily show to be correct. What a travesty – so Jones had been involved in all three IPCC reports. It’s amazing how often these guys just make stuff up. I’m far from expert on roles within the IPCC and their significance but I see Judith Curry seems to provide some support to Trenberth on this detailed point (though not on other things) from her experience. Or have I misunderstood? Thanks meanwhile to Roger for more of the backstory. Length okay, but reduce number of figures…. Then there is an important sequence of emails in September 1999 entitled “IPCC Revisions” following the Arusha meeting in which Jones, Briffa, Mann and Folland try to figure out what to do with the Briffa reconstruction in the IPCC TAR report in view of the decline, eventually leading to the deletion of post-1960 values. Jones was involved in this exchange. While Jones was a Contributing Author in TAR, he was a “Key Contributor” and involved in the writing process. To my knowledge, Jones and Trenberth both had the same standing in the 1990 and 1995 reports (Contributors), so Jones would have the same standing as Trenberth in these two reports – of which Trenberth described himself as ‘veteran”. Whatever one’s assessment of the relative degree of involvement of Trenberth and Jones in pre-AR4 IPCC reports, the fact remains that both Trenberth and Jones had joint responsibility as Coordinating Lead Authors for the content of Chapter 3 (Observations: Surface and Atmospheric Climate Change) of the AR4 WG1 report. accused Trenberth and Jones of ‘fabrication’ of an important reference within that chapter. See in particular section 3, paragraphs 17-19 of McKitrick’s submission. Fabrication in a scientific document is a serious offence, amounting to fraud by invention. There may be an innocent explanation for the alleged fabrication, but has Jones or Trenberth or the IPCC responded to McKitrick’s allegation? Anybody have an answer? It’s amazing how often these guys just make stuff up. Oh, Steve, that is so uncharitable 😉 Perhaps it is merely yet another demonstration that Trenberth appears to be afflicted by false memory syndrome?! Trenbeth could try to argue in a Bayesian way that there is enough evidence now to change the prior used to evaluate future research, but I don’t see how it makes sense to change around the null and the alternative in a classical stats context. He would do better by arguing from decision theory to use an explicit loss function rather than conventional significance levels–although that would just end up in a new debate over all the same issues. I’d buy into this argument if the works were significantly independent. That is, if there wasn’t a bias toward achieving and publishing the right type of result, and a lack of good cross checks (I should probably explain that here I mean another way to approach the same question that has at least some independence from the primary approach. Tree rings and so on are the problematic proxies, and their “goodness” isn’t predictable based on hard science per se.) Then top it off with what appears to me to be an almost EDA approach to analysis (which I consider improper from an experimental point of view). Questionable analysis, poor ability to cross check = high probability of erroneous results in my experience. I don’t think Bayes helps a lot with these problems, perhaps a statistician can comment? In my experience over the past several years, that doesn’t work — because deniers just ignore the evidence and continue to repeat their lies. Steve: if you have any complaint about my posts at Climate Audit, please identify them. On things like climate scientists blaming Climategate on FOI requests in face of chronological evidence otherwise, I agree that climate scientists all too often continue to repeat untrue statements and that it is discouraging that they ignore the evidence. However, I still believe that one should not simply give up. He is correct that “scientific facts” are not open to debate. Do you know how many “facts” there are in science? Let me give you a clue. In Climate science, Data are facts. Extrapolations from that data are not. So outside of the facts of the raw data (hidden by many that want us to believe one thing), there are no facts. It is therefore illogical for you to jump to the conclusion that anyone – here or elsewhere – are repeating lies. But since you so boldly made the statement, it is up to you to provide evidence that is so. Please do so. snip – prohibited topic under blog rules. Nice censorship  and quite ironic, given the manufactured “Climategate” nonsense. Steve – there is long standing blog policy against discussion of evolution. If you wish to discuss evolution, there are many other venues to discuss it but please do not do so here. I asked you to support your allegation of lies and request that you do so, rather than raise off-topic issues of no interest here. Steve: it is a longstanding policy that comments discussing “evolution” will be deleted. Think of another example for the point that you wish to illustrate. Again I asked you to justify your allegation of lies, which you continue to fail to do. My original post contained the allegation that in general deniers ignore rebuke and repeat the same lies. I was not thinking about about you when I wrote that, Mr. McIntyre. The blogger doth protest too much, methinks. Lisa, not sure if you’re aware of it, but “blogger” Steve McIntyre has previously been on the receiving end of false accusations of dishonesty. Accusations are easy to make (I think you just one yourself) – it’s harder to produce evidence, and it’s notable that that’s where these accusations have all fallen down. Perhaps frustratingly for his accusers, Steve McIntyre has been steadfastly scrupulous, and respectful of the truth (cf. RealClimate). Given this history of false accusations against him, you should be able to understand why he’s less than tolerant of what appeared to be more of the same (re: your comment). For reasons probably worth your while considering, skepticism about AGW has grown, not diminished. Contrast that with eg. skepticism about the tobacco / carcinogen / lung cancer connection. If you’re unable to make a persuasive argument using the truth, I suggest you pause and reconsider before deciding to resort to something other than the truth (or some well-judged mixture, as advocated by AGW honcho, the late Steven Schneider). The problem is that there are several grades of “deniers”. Most of the people here are certainly not any sort of “denier” if by that you mean someone who denies that the globe has become warmer over the past century or so. The question is just how much warming has occurred and to what the warming can be attributed. I’ll repeat something I’ve said before, that when dealing with controversial subjects one needs to seek the opinions of the people on the opposing side who present the best arguments for that side and try to refute their position. Complaining about the crudity and disingenuousness of less than the best people on a side is not a way to make progress. Nor is it the way to show intellectual honesty. I hope this will keep you from falling into the trap too many scientists fall into when they visit this site. I have not yet encountered anyone who (1) denies that fossil fuel emissions are the primary cause of global warming, (2) is intelligent, and (3) is honest (or at least refrains from disingenuous rhetorical tactics). Steve: it is an editorial policy of this blog that there is no purpose in trying to prove or disprove AGW from first principles in a couple of sentences and that, if left unchecked, every thread quickly becomes the same. Accordingly it is a blog editorial policy not to have such discussions. There are many other locations that don’t mind such discussions. You were asked by Steve to provide an example of how he’s lied. You have avoided doing so. Since Trenberth refused, do you care to make points (2) intelligent and (3) honest comments on the use of the statistics??? I pointed out that the ‘denied’ assertion is not itself a statement found in the IPCC reports or the scientific literature. How on earth is that debating AGW? I’m not sure, given Trenberth’s talk, whether it’s OT either. Still, your blog etc. and thanks. The assertion that a debate is not the way to counter lies is a very interesting claim.